The Vale of Glamorgan is ideally situated as your base for exploration of Southern Wales and all it has to offer. From Castles to Golf and from shopping breaks to the Welsh National Opera, there is something for everyone in all seasons. Just outside the city are the high acclaimed Museum of Welsh Life, the outstanding Grade 1 listed Duffryn Gardens and the historic town of Cowbridge, a 'foodies' paradise. If you've time to travel a little further the awe-inspiring mountains and waterfalls of the Brecon Beacons are within easy reach. If you want to absorb some culture and entertainment during your stay, there are festivals and events taking place in both Cardiff and the Vale of Glamorgan in every season. Visit our blog page for updates of forthcoming events. Your experience can be action packed, relaxing and reviving or a combination of both. The protected 'Heritage Coast' is the closest stretch of coast to Cardiff, capital city of Wales. Some of the most breathtaking seascapes imaginable make it a walkers' paradise. It's a great place to cycle too as its possible to reach hidden bays and scenic views denied to those travelling by car. A walk in the countryside refreshes and enlivens whether you're wandering through ancient woodlands or along the banks of a fast flowing river. The picturesque countryside steeped in beauty and culture, is dotted with legendary villages and historic towns. The choice of courses available for golfers is superb whilst fisherman may choose between an invigorating day at sea or inland at one of the specialist trout and coarse fisheries. We are pleased to be able to offer The Little Cottage,( Y Bwthyn Bach), as self-catering accommodation for a minimum let of two nights. 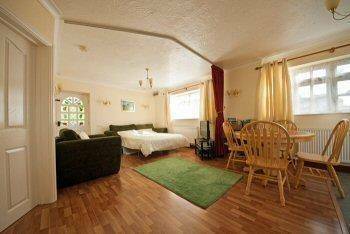 The cottage provides luxury accommodation for two people but can accommodate up to four. The ground floor accommodation is particularly suitable for guests with limited mobility. Walkers and golfers are welcome. 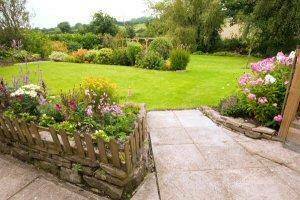 Situated a few yards away from the main house, the Little Cottage is tastefully decorated, comfortably furnished, centrally heated and double-glazed. The accommodation has been awarded 100% for cleanliness at our last three Visit Wales inspections. 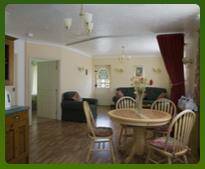 The spacious ground floor accommodation is wheelchair-friendly and comprises a large kitchen / living area, a bathroom and one bedroom which may be twin or super king bedded. In the bedroom ample storage space is available together with an additional flat screen television and hairdryer. The front door alongside the dedicated parking area opens into the living area which has double bed settee, large easy chair, a flat screen television, video and an extensive supply of tourist information. Access to free WIFI is available on request. The well-equipped kitchen has an electric oven and hob, a combination microwave, oven, a fridge, a dining table and four chairs. An iron and ironing board are sited in the broom cupboard. A laundry service is available at a reasonable price. 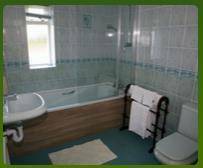 The bathroom has a wash hand basin, a bath with an overhead shower with transfer points for a wheelchair alongside the bath and WC. The rear door leads to a patio area with a garden table and chairs for 'al fresco' meals in an attractive secluded garden, with ramped access suitable for a wheelchair. Within the garden are a pond and natural stream. Guests are welcome to sit in any part of the garden, ample seating is available. Walkers and golfers are welcome, storage and clothes drying facilities are available in our boiler room alongside the cottage. Children over 12 years and babies up to the age of 18mths are welcome. 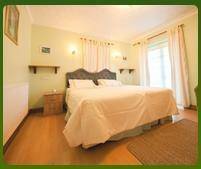 The self catering tariff includes all bedding and bed linen, towels and tea towels. For your convenience and with our compliments, a small welcome starter pack of essentials is provided which includes tea, coffee, sugar, milk, kitchen roll, soap, washing up liquid, Clingfilm, toilet paper and bin liners. A travel cot and high chair are available on request. The cottage is strictly non-smoking and pet free.